I’ve been looking for an excuse to make this sweater for years. I stumbled across the book Greetings from Knit Café, by Suzan Mischer, in my local library and loved the patterns, so I got my own copy. Some of the designs are fairly impractical (a knit evening gown, for instance), but others I’ve just been waiting for a chance to try. And even the ones I would never make, I love looking at. My chance to make this pattern came because Munchkin is enough smaller at this age that he can’t wear the sweaters Little Bear wore. I altered the original pattern in a lot of ways. Too many ways, actually. I’m going to tell you about them all in this post, but I’m going to STRONGLY recommend that you don’t do what I did. At least not all of it at once. Don’t get me wrong; I love how the sweater turned out. But it was a much bigger pain to make than it had to be. I changed my mind about the stitch pattern. Twice. I lost track of where I was in the pattern and what I was doing and had to rip out inches of knitting to get back to a place where I had forgotten to do something. And I messed up my math at one point, requiring me to backtrack (again). In the end, the original pattern was more of a guideline of how to make it than a pattern that I followed. Again, I don’t necessarily recommend this. I often tweak patterns that I use, and I generally like how they turn out. But if little people are constantly distracting you, it’s a lot easier to pick up where you left off if you’re following an actual pattern. Gauge: The pattern calls for 5.75 stitches per inch with size 5 needles. Instead, I used size 6 needles. I like my stitches to be a little looser, so I almost always use needles a size bigger than the yarn calls for. Personal preference. I just had to do a little math to get the right measurements instead of following the numbers in the pattern. Ties: The pattern calls for 6 stitches across the ties; I used 4, partly because I had a larger gauge and partly because I liked them a little narrower. Not a big change, and it worked just fine for me. I continued this pattern for the whole body of the sweater, placing stitches on hold for the sleeves and shaping the back of the neck as directed. There’s a slit in this section so that the Right Front can wrap across and through. I knit a couple of rows of garter stitch before and after the slit to try and keep the edges from rolling. 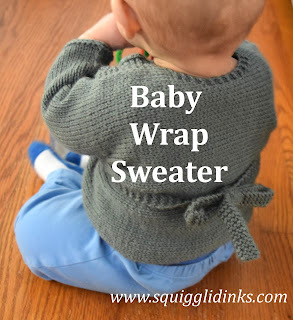 The sleeves in the original pattern are knit flat on straight needles (super simple! ), then the sleeves and shoulders are all finished with the three-needle bind-off so that no seaming is necessary. Instead, I sewed the shoulders first, then knit the sleeves on double-pointed needles (dpn). I made the sleeves about an inch longer than the pattern calls for, too. Don’t change the gauge on this. It’s too much of a pain just to go up one needle size. I really like the look of stockinette stitch, so I don’t regret making that change. But even with the garter border, the edges roll a little (especially the bottom edge). I almost wish I had followed the instructions for honeycomb stitch, or had at least stuck with my first alternate, garter stitch. I’m really glad I did the sleeves the way I did. (If you hate knitting on dpn, then I recommend following the original pattern directions. I actually love using dpn.) Plus, the new sleeve length is perfect for Munchkin. 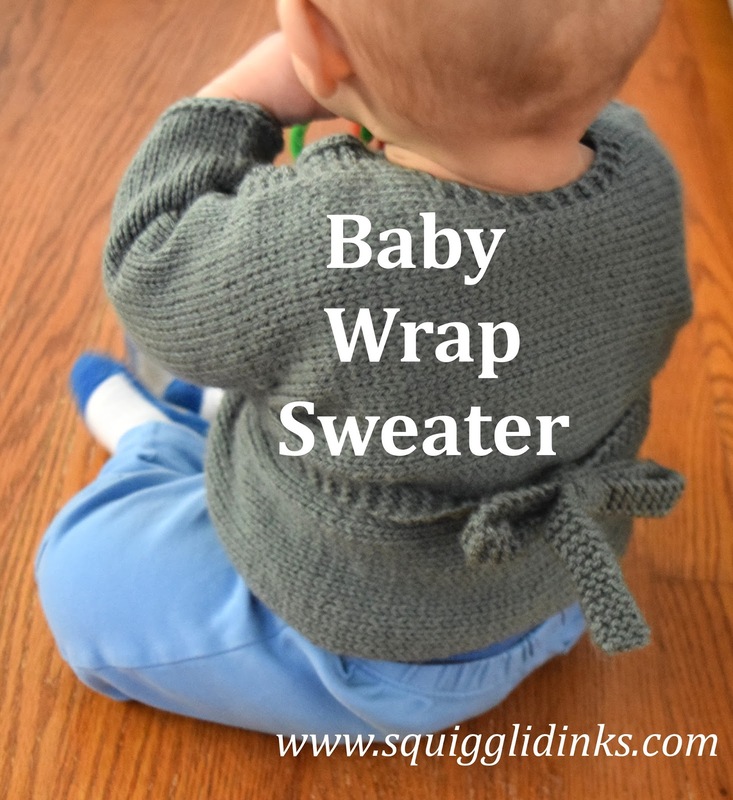 I would absolutely recommend this pattern to anyone who wants to make an adorable baby sweater, regardless of skill level–it’s a pretty simple pattern (when you don’t mess with it). If you like my changes, go ahead and mix them in. And if you ever have questions about adapting a pattern so that it works better for you, email me!